Such a different book from my first (and until now only) Doris Lessing (The Summer Before the Dark). 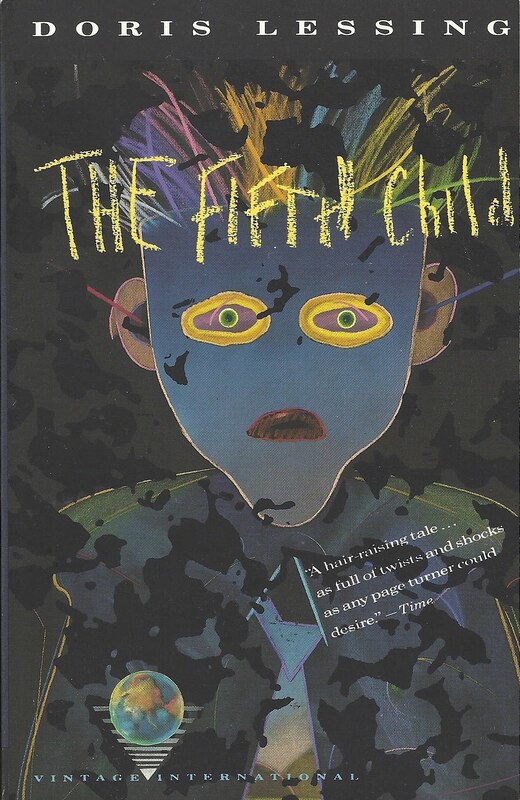 The Fifth Child is a fast moving story that starts off rather conventionally introducing David and Harriet’s happy and rather mad rush into love, discovery, and warm hospitality but then turns slowly into something akin to a horror story. Not a blood and guts kind of horror story which seems so far from our personal frame of reference, but one which is infinitely scarier. The kind of horror story you can imagine coming true. The kind that might even remind you of someone you know. Before I get myself into trouble explaining that last sentence or two let me first lay out the plot (spoilers and all) so I don’t have to try and be clever. Harriet and David want a big family. Four kids seem to be the minimum, six might be nice, eight would be even better. In pursuit of their desires they buy a large house that they set to filling both with offspring but also with their extended family and friends. Always the place to go for the holidays, their house is always alive and almost always a happy, loving place. That is until Harriet becomes pregnant with her fifth child. As her pregnancy takes an ominous turn Harriet becomes harder and harder to be around. By the time she gives birth to Ben, her 11-pound fifth child, Harriet is convinced the baby is more beast than human. From there things go from bad to worse. Ben develops into an unusually strong, uncontrollable, anti-social child. As a result the other kids are frightened, the Harriet and David’s marriage is strained and the big family gatherings become less and less appealing to their extended family and friends. Although published in 1988, the action begins in the 1960s and so Ben’s condition is never explained in a way that we would expect today. Indeed that is part of the problem, Harriet never manages to find the support she needs from either her family or the medical establishment. And it wreaks havoc on her life, the lives of her children and her relationship with her husband. The horror that I mentioned earlier is not about Ben’s differences but about the way society can and can’t deal with those differences and the toll it takes on those responsible. And how not everyone can rise to the challenge of caring for special needs children. Although the story is disturbing, Lessing is an amazing writer and it is no wonder she won the Nobel Prize for Literature. She works about 20 years into 133 pages and does so in a way that never makes it feel rushed. I have two other Lessing novels on their way to me somewhere in the USPS and I can’t wait to see how they stack up to the two I have already read. Have you added Lessing to your Nobel TBR? I've not read any of Lessing's work but it is clear that I should at least add this one to my TBR after reading your review. At the risk of sounding trite, just the book cover alone has me completely intrigued. I have read one Lessing but I found it tough going. About the “pink triangle” I have not read anything like this and thanks for highlighting a book which for me is a new topic. I'm leaving one of those dreaded “I didn't read this post” comments, but please forgive me for it! I skimmed your post, as I have this book near the top of my TBR pile and want to go in as unspoiled as possible (so thank you for the warnings), so I'm excited to see I'll have this review to pop back to once I've read it. For me this title certainly seems like a more accessible Lessing title, though perhaps not in terms of content… We shall see! Kathleen: Because the two that I have read are so different, I am dying to dip into the two that are on their way to me. Mystica: Which Lessing did you try? Mrs B: Well so far I like Lessing a lot so it will be interesting to hear what others think. Steph: I am glad I made note of the spoilers. If you want to be surprised I surely would have ruined it for you. Can't wait to read what you think of the book. I tried Lessing years ago and couldn't get into her. Maybe it's time I tried again, though. This one sounds extremely interesting. Lessing is an amazing writer. I haven't read this one but WOW….I'll acquire it soon, I can tell. Thanks for the review. Emily: I have heard folks talk about difficulty with Lessing, but I thought that The Fifth Child and The Summer Before the Dark were quite accessible. Bibliophile by the Sea: The used copy of The Golden Notebook that I found out in Portland just arrived and I am really ansty to start on it. Sandra: I found The Fifth Child disturbing enough that I am not sure I am up to reading a sequel.